Today is Sweden National Day. I haven’t been to Sweden and I do regret not visiting while we lived in Europe. So it’s high on my list of places I want to still visit. 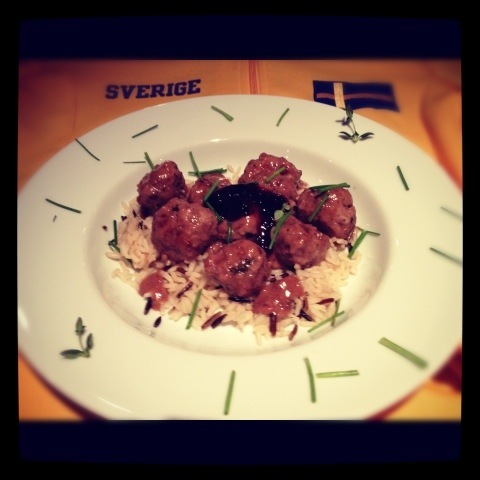 I have no idea how authentic Swedish Meatballs are – I know that IKEA has popularised them, but I’m not sure if they are an IKEA invention or indeed one of Sweden’s national dishes. Anyway they are very tasty, and I still live in hope that one day IKEA will open in New Zealand! Ligon berry, cranberry, blackberry or blackcurrent jam to serve. Set aside a few of the herbs, then add the rest into a large bowl with the pork, beef, egg, milk, breadcrumbs and allspice. Add pinch of salt and pepper, then scrunch and mix well with clean hands. Roll mixture into 30 little balls. Keep wetting your hands to get them nice and round. Put on a large oiled tray and put in fridge for one hour to firm up. Cook the meatballs in olive oil and fry gently for 10 – 15 minutes, tossing occasionally until they are golden brown. Transfer the meatballs to a large plate, spoon away any excess fat from the pan, then add lemon juice, stock, flour, cream, heaped tablespoon of jam, pinch of salt and pepper. Bring to the boil, then turn heat down and reduce until you have a nice consistency that will cling to the meatballs. Return meatballs to the pan and move them around so they get coated in the sauce. Serve the meatballs drizzled with any leftover sauce from the pan and a few spoonfuls of warmed-up jam on top.